What do you do if your university is the target of an aggressive publicity campaign that distorts and misrepresents the work of one of your most highly respected scientists? What do you do if hundreds of thousands of people sign a petition calling for a research project to be cancelled, even though the petition contains numerous errors of fact? What do you do if a media campaign, backed by several of the world’s largest animal rights groups threatens to undermine academic freedom and the research evaluation process at your University? Do you ignore it? Do you give in? What do you do? So did UW-Madison give in? Did they simply ignore the petition? No, they did something much better. UW-Madison issued the response below rejecting the erroneous claims made by the author of the petition, Dr Ruth Decker, and defending Professor Kalin’s right to undertake important research. Just as importantly they defend the right of the scientific and medical experts at UW-Madison and the NIH – and not the misinformed mob – to decide which projects should be approved and funded. We commend UW-Madison on taking this strong position in support of science. 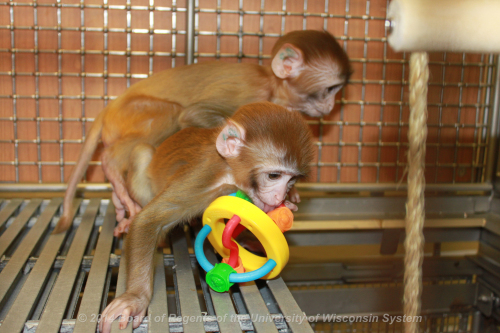 Since September, many people have taken interest in a University of Wisconsin–Madison study on the impact of early life stress on young rhesus monkeys. Thousands have added their names to a petition on the website change.org, calling for an end to the work, and we appreciate and share their concern for animals. But we don’t appreciate the way petition’s author, Dr. Ruth Decker, misrepresents the research. By piling up mistakes, myths and exaggerations, and omitting important information, she asks well-meaning people to speak out with little understanding of the real science and the long, deliberative process through which it was approved. This isn’t fair to the people who signed the petition, or to UW–Madison psychiatry professor Ned Kalin and the scientists involved in the work, or to the millions of people who suffer from mental illness for whom available treatment methods offer little relief. The truth is of little concern to activists who wish to end animal research, no matter the benefit to humans and animals. We don’t share that sentiment. We prefer people make their judgments on animal research with a fuller understanding of the research — of both its costs and potential benefits. This is not a repeat of experiments UW–Madison psychology professor Harry Harlow conducted as many as five decades ago, some of which subjected animals to extreme stress and isolation. The methods for the modern work were selected specifically because they can reliably create mild to moderate symptoms of anxiety in the monkeys. They were chosen to minimize discomfort for the animals, and to minimize the number of animals required to provide researchers with answers to their questions. There is no “solitary confinement.” The animals live in cages with other monkeys of their own age, a method of care called peer rearing. This method is often used when mothers reject their infant monkeys, which happens regularly in situations from nature to zoos to clinical nurseries with first-time mothers or following caesarean-section births. In a group setting, even veterinarians would have difficulty distinguishing the peer-reared animals from those that that were maternally reared. The purpose of peer rearing is not to demonstrate that removing a monkey from its mother causes anxiety, a common misconception we have heard from people who have signed the petition. Again: peer rearing was chosen because it is known to produce mild to moderate anxiety symptoms. With a group of animals predisposed to anxiety raised in a controlled setting, researchers can use state-of-the-art techniques to observe and measure even very subtle differences in brain chemistry and structure. Those chemical and anatomical differences may suggest new treatments — via nutrition, exercise, meditation, drugs or another approach — for people suffering from mental illness. The animals in the study are not “terrorized,” and do not experience “relentless torture.” Most of their time is spent as a house pet would spend its days — grooming, sleeping, eating and playing with toys, puzzles and other animals. On occasion, to assess the monkeys’ level of anxious temperament, they are observed under two anxiety-provoking conditions. The first involves the presence of an unknown person who briefly enters the room, but does not make eye contact with the monkey. The second involves the monkey being able to see a snake, which is enclosed in a covered Plexiglas container in the same room, but outside the monkey’s cage. After each event, the animal’s brain activity is monitored by a non-invasive functional magnetic resonance scan, and blood samples are taken. The stress the monkeys experience is comparable to what an anxious human might feel when encountering a stranger or a snake or a nurse with a needle. No one was “left out” of the review by UW–Madison oversight committees. Several university committees spent a great deal of time assessing Dr. Kalin’s anxiety research, and each committee found it to be acceptable and ethical. These were groups of researchers, veterinarians and public representatives tasked with considering animal research on ethical grounds, and with ensuring potentially beneficial research will subject the fewest animals to the least invasive measures. As the petition notes, an animal rights group took allegations about the committee process to the U.S. Department of Agriculture. What the petition does not mention is that USDA conducted an investigation in August in response to that complaint. Inspectors found the complaint lacking merit, and the process to be entirely within compliance with federal regulations. And, as with all animal research on campus, specially trained veterinarians will care for the monkeys involved and ensure that all the work is done in accordance with federal regulations enforced by the National Institutes of Health and the USDA. Most importantly, the petition repeatedly maligns the research as “needless” and “unnecessary.” We and many others think otherwise. Dr. Kalin, who treats human patients with anxiety and depression disorders, has worked for more than 30 years to understand both inherited and environmental causes of mental illness. His research was also reviewed and supported by panels of scientists at the National Institutes of Mental Health. The decision to study animal models to understand human psychiatric disorders is not made lightly. Roughly a quarter of the people in the United States, including children, suffer from mental illness. Their conditions subject them to immeasurable disability and dysfunction. And the worst outcome, suicide, is increasing and already among the leading causes of death in adolescents. To develop effective treatments that may alleviate the suffering of millions, it is necessary to understand the root cause of psychiatric illnesses. In this case, the human suffering is so great that Kalin, the National Institutes of Health and UW–Madison’s review committees believe the potential benefit of the knowledge gained from this research justifies the use of an animal model. More information on the anxiety and depression research is available at animalresearch.wisc.edu. Posted on October 20, 2014 October 27, 2014 by EditorPosted in Animal Rights News, NewsTagged mental illness, monkey, Ned Kalin, NIH, peer rearing, psychiatry, University of Wisconsin-Madison.